It must be a system of transportation, whether that be of people, of electricity, of water, of goods and services, of data, of communications, or what have you. It must be an essential service, one that the state either does operate or would be willing to operate as provider of last resort. A thing must meet both conditions to be a public network. If it only meets the first condition, it’s a private network, like a race track or a rail line that’s used for tourism. If it only meets the second condition, it’s a public service, like the public education system, or a health service. Importantly, #2 implies that a public newtork need not necessarily be operated by the state, only that the state is willing to operate it if necessary because it is viewed as essential to a well-functioning society. For instance, some roads are private tollways while others are public highways, but all roads are part of a public network–the state would operate private tollways as public highways if it had to. By contrast, if a race track were to close down, the state would not necessarily step in and run that race track, because race tracks are non-essential. The failure of a race track is like the failure of any other business. The same goes for networks that become obsolete, like the telegram, or networks that become tourist amusements, like a novelty rail line, or networks that are used by very few people, like a flash drive or your driveway. There are many things that may or may not be essential, but which are not networks in any case, like farms, factories, houses, and so on. 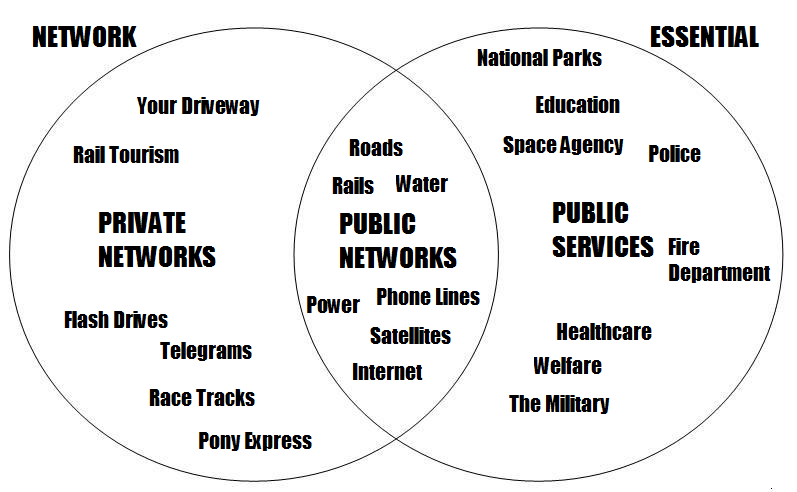 If essential, these are public services rather than networks. If non-essential, they are considered private property and whatever rights states have chosen to grant to private property holders apply. The state can, and usually does, run public services however it wants. We expect the state to have data on both the operators and users of public services. The state has records on students, police officers, criminals, firefighters, people on welfare and other benefits, soldiers, patients, doctors, and so on. Traditionally, the state has had a harder time taking data on the users of public networks, because public networks do not usually have lots of operators or overseers. If you get on the average road, you are not apt to come into contact with any agent of the state in the course of your using a road. That said, the state does permit itself to watch you while you use the road insofar as it can find the resources–it employs police to patrol the roads, it uses tolls to control access, it may even employ cameras in lieu of on-duty officers. If you commit a crime on the road and an officer or camera sees it, that officer or camera can be used against you in court. But it is impossible for the state to see what every car is doing on the road at the same time. However, this is not a limitation on state snooping that derives from any principled state objection to watching citizens, it derives merely from resource scarcity. New technology has eliminated some of this scarcity. Now the state can automatically meter our use of electricity and water, it can record our phone calls, it can record what we do on the internet. However, the state does not have the manpower to listen to all of our calls or look at every page every citizen visits. It has the capacity to put all of this information into a searchable database, perhaps, but it is still only possible for a tiny fraction of that database to actually be looked at or listened to. Britain is at the cutting edge of all of this–it has 1 state-operated camera for every dozen people–but the British cannot and do not watch the mountain of mostly uninteresting footage the cameras pick up. However, if the state were to get the capacity to know what was going on on all of the public networks at all times, we can be fully confident that it would do so, because the state wants to enforce its laws governing what people may do on public networks with maximum efficacy. Any law that ought not to be vigorously enforced by the state ought not to be law in the first place. Now, the argument could be made that roads, railroads, air space, and other such public networks are fundamentally different from the internet or the telephone because misuse of networks in the former category can lead to car/train/plane crashes and subsequently death, while people do not usually kill each other over the phone or via laptop. But this simply isn’t so–bombs can be detonated remotely via phone and computer, hackers and identity thieves often commit crimes entirely via computer, criminals can plan crimes via the web or over the phone, and perhaps, in the future, people will operate drones or give instructions to driverless cars through the internet or via their phones, allowing them to cause horrible real-world accidents with them not unlike the automobile accidents that take place on the road network. Indeed, as technology progresses forward, the internet’s capacity to cause real-world damage will only expand. The internet is and will be a place in which citizens can be harmed by one another in legally meaningful ways, like a road. No, there can be no division of public networks between those that transport people and objects and those that transport messages. If I am walking down a public sidewalk and I, in the presence of a police camera, announce my intent to commit a murder, and some officer happens to look at that camera, he would be entitled to investigate me. The same goes for some NSA agent sitting in a room looking at my internet activity–if I announce my intent to commit a crime, it is just like he heard me say it on the street. That said, this argument does not necessarily justify state spying. Perhaps we think that state monitoring of the public networks is not a cost-effective way of preventing crime. Perhaps we enjoy our privacy on these networks so much that we would rather endure a higher crime rate in order to maintain that privacy. However, if we are going to make that argument, we need to recognize that if it is to be consistent, it must apply to all public networks. An argument against state surveillance of the internet or the phone network is an argument against state surveillance of the roads, against CCTV, against all police action that is not incident or suspect-specific. That would be a significant extension of privacy rights beyond their generally recognized limits, but it’s a debate we certainly could have. What we mustn’t do is equate state surveillance of the internet with the state breaking into your house without a warrant. It’s much more comparable to the state watching for erratic drivers they should ticket for driving under the influence, or walking the beat looking for suspicious activity, or watching what goes on in a dangerous neighborhood via CCTV. We must also acknowledge that if it is okay for the state to monitor public networks insofar as technology makes it possible for it to do so, it may one day be possible for the state to watch or listen to much more of its data than it does at present. If the state can ticket anyone it catches speeding or driving under the influence on a road, the limiting factor on the state ticketing people is its capacity to catch them. If say, the state deployed cameras everywhere and had an AI police officer watch all of them in a fraction of the time it would take a person to do it, that AI officer could ticket millions of people every minute of every day. The trouble is that we do not fully trust the state to make just laws. We would like it if every person who drove under the influence were ticketed by the AI officer, but we don’t want the same thing to happen to run of the mill speeders. We’d like every internet identity thief to be caught, but we don’t want the state arresting people for possibly legitimate dissent. At the end of the day, our problem is not with surveillance in and of itself, but the laws the state is using surveillance to enforce. The question of whether or not state surveillance is a good thing is synonymous with the question of whether or not we live under a sustainably just state, one that is not only just at present, but that we expect to continue to be just for some time. If your answer to the question of whether or not your state is sustainably just is “no”, you have much bigger problems than surveillance. Reblogged this on Transportasi Jawa Barat.